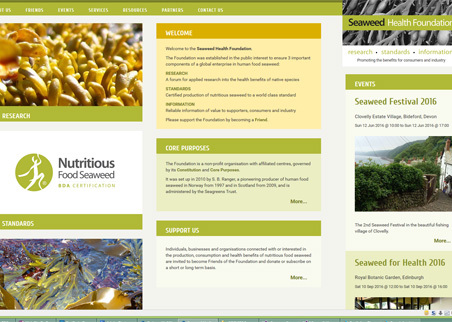 The Seaweed Health Foundation is an independent non-profit organisation. Through its website, events and services, the Foundation aims to assist those producing, consuming, selling and researching certified seaweed for food and health. It has the facility for classes of members such as the Management Group and Advisory Board to log-in to update individual profiles on the frontend according to their status. Resources such as photos, videos and documents are added via the backend to be made available to the public on the frontend, or to have their availability restricted to specific classes of members. Forthcoming events are added and maintained via the backend. Fully integrated with PayPal to allow donations and membership payments.